You can't sleep through the night because of hip pain. You may also need to stop taking medicine that can make you more likely to get an infection. This includes methotrexate, Enbrel, and other medicines that suppress your immune system. You will stay in the hospital for 1 to 3 days. During that time, you will recover from your anesthesia and from the surgery itself. You will be asked to start moving and walking as soon as the first day after surgery. Some people need a short stay in a rehabilitation center after they leave the hospital and before they go home. At a rehab center, you will learn how to safely do your daily activities on your own. Home health services are also available. Hip replacement surgery results are often excellent. Most or all of your pain and stiffness should go away. Some people may have problems with infection, loosening, or even dislocation of the new hip joint. 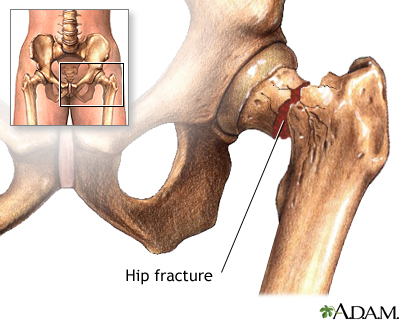 Over time, the artificial hip joint can loosen. This can happen after as long as 15 to 20 years. You may need a second replacement. Younger, more active people may wear out parts of their new hip. It may need to be replaced before the artificial hip loosens. American Academy of Orthopaedic Surgeons website. OrthoInfo. Total hip replacement. orthoinfo.aaos.org/en/treatment/total-hip-replacement. Updated August 2015. Accessed September 13, 2017. American Academy of Orthopaedic Surgeons website. Preventing venous thromboembolic disease in patients undergoing elective hip and knee arthopolasty: Evidence-based guideline and evidence report. 2011. www.aaos.org/research/guidelines/VTE/VTE_full_guideline.pdf. Accessed September 13, 2017. Cabrera JA, Cabrera AL. Total hip replacement. In: Frontera WR, Silver JK, Rizzo TD, eds. Essentials of Physical Medicine and Rehabilitation: Musculoskeletal Disorders, Pain, and Rehabilitation. 3rd ed. Philadelphia, PA: Elsevier Saunders; 2015:chap 61.